Mumbai: BIG FM, India’s largest radio network, known for innovative programming and concept based shows, has announced Season 2 of its popular show ‘Lamhe’. The outstanding response received for Season 1 gave impetus to bringing back the captivating show in a bigger avatar. 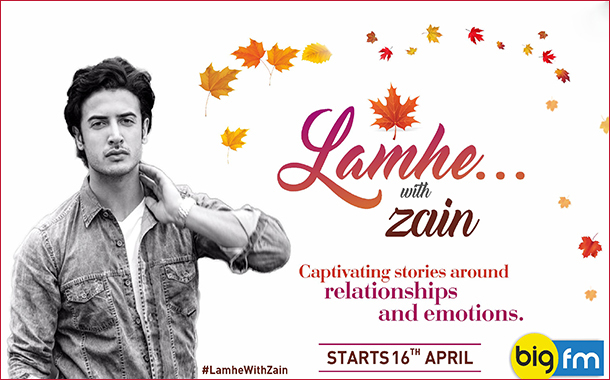 Titled ‘Lamhe with Zain’, the show will be anchored by the talented Zain Khan Durrani. This time around, listeners will be treated to riveting stories revolving around relationships and emotions on this fiction based thematic drama show set to launch on 16th April 2018, weekdays on BIG FM. The refreshing format of the show ensures that each episode will bring with it a unique story, which will leave the audiences asking for more. Listeners will also be treated to some excellent songs, which will be seamlessly weaved into the narrative, thereby delivering a complete entertaining experience. Tags: BIG FMconcept based showshas announced Season 2India’s largest radio networkinnovative programmingpopular show ‘Lamhe’.